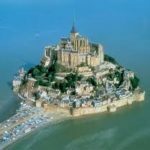 Perched high on a 264 feet rock formation on the coast where the regions of Normandy and Brittany meet in France, sits the UNESCO world heritage site of Mont St. Michel. During the highest tides the abbey is completely surrounded by water. During low tide the flat marshes seem like a vacant salt land. It is an amazing sight to watch the crawling waves gush around early evening to embrace the church. If you are in the church then you will have to wait till the water recedes to the deep ocean. This happens every single day. The internal walls of the church depict more of sun god sculptures almost like the Romans. 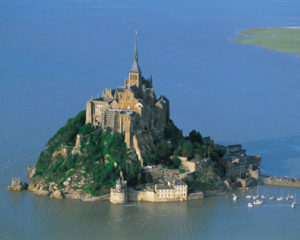 Mont St. Michel is name after the arch angel St. Michael. It is known as the mervellie de l’ occident or wonder of the western world. The granite used to build the abbey was transported by boat from nearby isles. Construction of the abbey took more than 500 years, from 1017 to 1521. 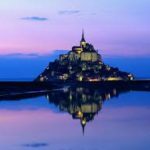 The origins of Mont St. Michel can be traced back to a legend that has arch angel Michael appearing in series of dreams to Aubert, bishop of avranches. 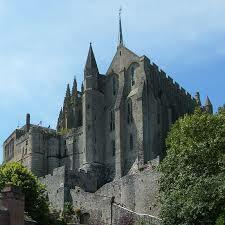 St Michael implored Aubert to build a church on what was then a barren rock called Mont Tombe. The original church structure was completed in 1144. Pilgrimage never stopped even when the abbey fell in the hands of the British, during the hundred years of war. The abbey s monastic independence was undermined during the 17th century, when the monks began to flout the strict rules and discipline of the order, drifting in to a state of decadence that culminated in their dispersal from the abbey. This place served as a prison for a period of time. In 1874, the abbey was handed over to the French government with the aim of preserving the abbey for ages. Emmanuel Fremiest s famous statue of St. Michel was added to the spire in 1897. Currently monks live and work here again, just as in medieval times.